And much more! You can read more in a publication from Harvard Medical School. May is Mental Health Month, and there’s no better time to beef up your knowledge of mental health facts and information. 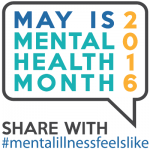 There are a number of great materials available via Mental Health America, Canadian Mental Health Association, and NAMI. We’ll be bringing you some of these resources on the blog throughout the month. Starting with Mental Health America’s Infographic about Anxiety. Anxiety disorders are some of the most common mental health conditions — experienced by an estimated 21% of American adults. People living with anxiety describe it as, “Being so scared you’re paralyzed” and “Being powerless against your own mind.” Check out the infographic below for more information on what anxiety is, how it feels to those who experience it, and tips for tackling it.